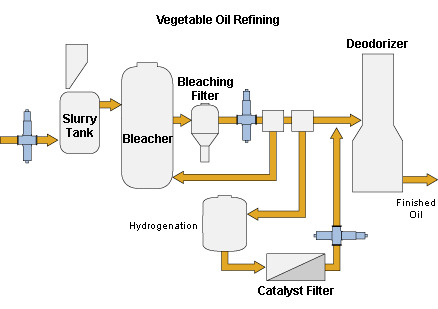 Vegetable oil refining is a process to transform vegetable oil into fuel by hydrocracking or hydrogenation. Hydrocracking breaks big molecules into smaller ones using hydrogen while hydrogenation adds hydrogen to molecules. These methods can be used for production of edible oil，gasoline, diesel, and propane. High-activity clay is added into oil, mix and heat mixture of oil and clay to make the small particle of pigment absorbed on the crystal of clay. This machine is of perfect mechanism, reliable performance and is well a configured piece of equipment.The filtration is a key process step in the edible/vegetable oil industry,Crude oil filtration for removal of foots, safety filtration to improve filtrate quality and/or to protect. Hydrogenation of oils is done to give the finished oil a higher melting temperature and better oxidation stability, improving the product’s resistance to spoilage. Generally, nickel-based catalysts are used in this process. Once the hydrogenation is complete, the nickel catalysts must be filtered off. Filtering off the catalyst can be controlled， thus reducing the loss of nickel catalyst and optimizing the filtration process while ensuring final product quality. Using KMEC vegetable oil refining throughout the vegetable and edible oil processing minimizes sampling and timely lab testing, while recording measurements inline and in real-time. Operating costs are greatly reduced due to reduced losses, downtime, and reworking. KMEC machines can improve filtration throughput, reduce re-circulation time and reduce usage of filtration agents like bleaching clay and nickel catalyst. We are always committed to provide the professional and advanced vegatble oil refining that are suitable for all kinds of oilseeds and for refining all kind of vegetable oils. Don’t hesitate to contact us in the following form to learn more about our vegetable oil refining plant! This entry was posted in Oil Extraction Process, Uncategorized. Bookmark the permalink.